The Piano Lesson by Henriëtte Ronner-Knip, 1897. One does not have to be a fan of classical music to be familiar with the works of French composers Claude Debussy and Maurice Ravel. The two rivals were part of the Impressionism movement in classical music, a movement inspired by Impressionist painters like Monet, Manet, and Renoir and poets such as Verlaine and Baudelaire. 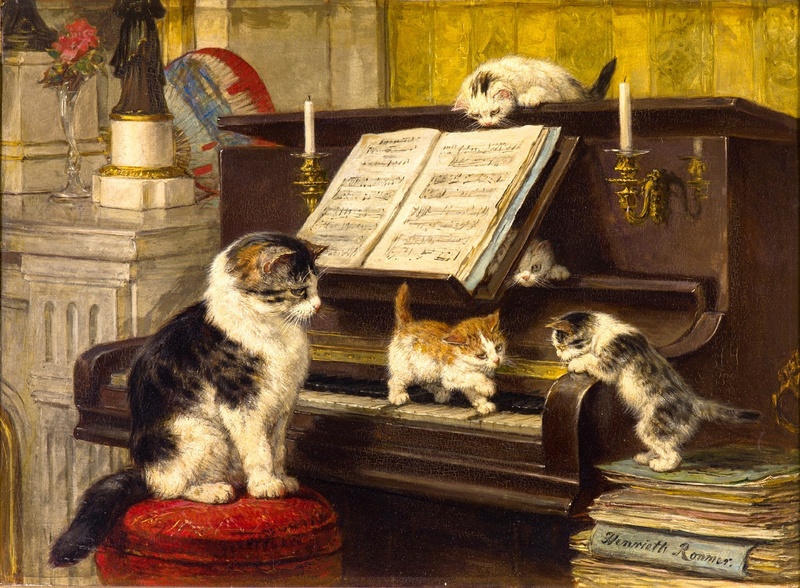 They were also renowned cat lovers who famously allowed their feline muses to prowl at liberty amongst their papers while composing such masterpieces as Clair de Lune and Boléro. 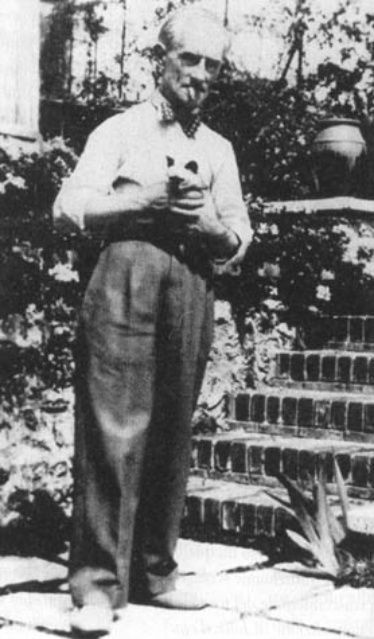 Maurice Ravel with his Siamese cat, Mouni, at Belvedere, 1929. 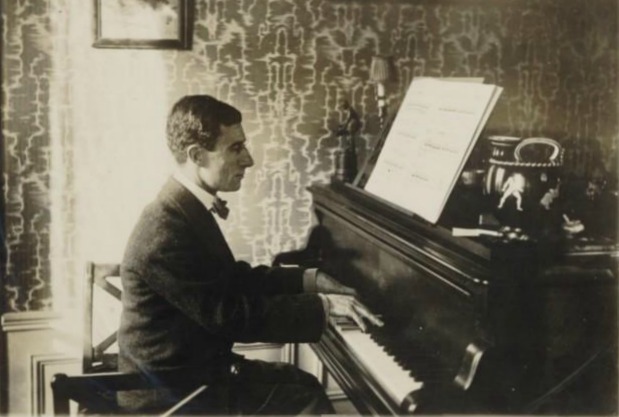 Maurice Ravel on the Piano, 1912. 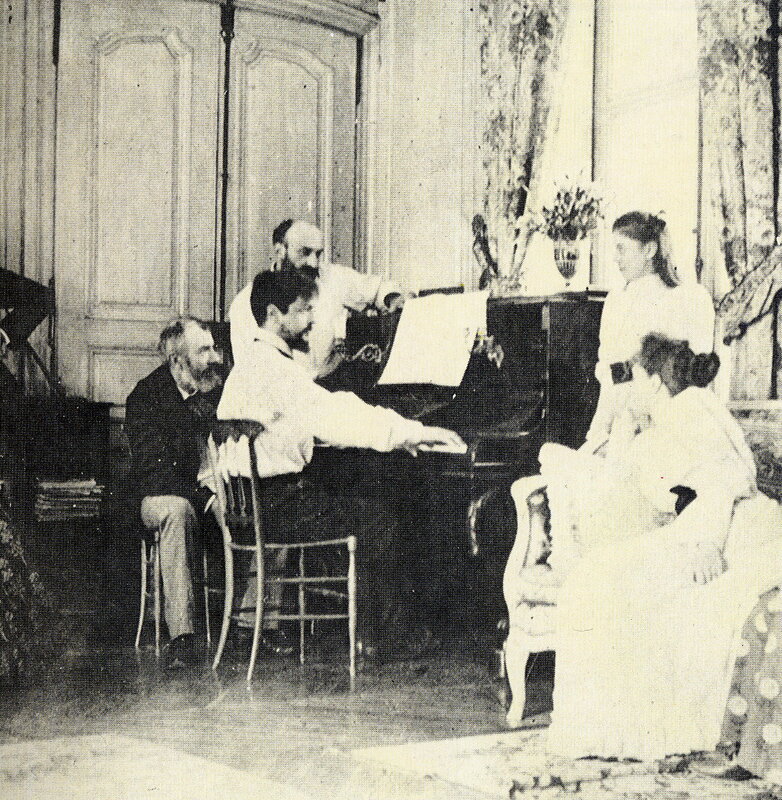 Claude Debussy at the Piano in front of composer Ernest Chausson, 1893. 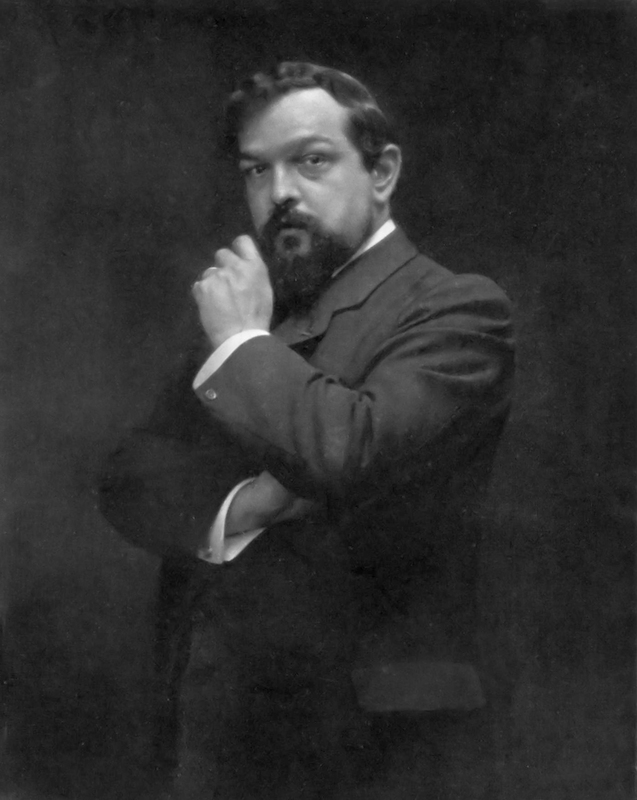 Debussy died on March 25, 1918 at the age of fifty-five. Ravel died on December 28, 1937 at the age of sixty-two. I can find no definitive evidence that their cats inspired their work. Still, I cannot help but wonder what role those cats might have played in the creation of such masterpieces as Clair de Lune and Boléro? Were they merely the pets of two of the greatest composers of all time? Or did they act the part of muse? As someone who does her best writing with a cat curled up beside her and a dog at her feet, I am inclined to believe the latter. What do you think? Apel, Willi. Harvard Dictionary of Music. Cambridge: Harvard University Press, 1969. Goulding, Phil G. Classical Music: The 50 Greatest Composers and Their 1,000 Greatest Works. New York: Ballantine Books, 1995. Jacobson, Julius H. The Classical Music Experience. Naperville: Sourcebooks, 2008. Jensen, Eric Frederick. Debussy. New York: Oxford University Press, 2014. Seroff, Victor. Debussy; Musician of France. New York: G. P. Putnam, 1956. Smith, Jane Stuart. The Gift of Music: Great Composers and Their Influence. Illinois: Crossway Books, 1995. Absolutely. :) I have 10 & adore every single one of them for their quirky ways & loving hearts. Not sure how people live without a cat or two in their lives! Another great article. Both men are favorites. A beautiful time in the artistic community. I play the cello and always had my cats trying to grab my cello bow while playing…still would never think of excluding them from being present. As Sarah said Purr-fect! Thanks so much, Anine:) I agree, the impressionist period really was a beautiful time in art & music! Sorry but I don’t have a cat or dog currently due to my current living situation. However, I do believe they can be a writer, books or music, muse. I think so too, Lindsay :) I hope things will change so you can have another pet someday soon! I play the piano and when I’m sitting on the bench playing, Lily, my mini schnauzer always jumps up to sit beside me. Like Debussey, I often find myself preferring the company of our three dogs and four cats to humans. What a nice image of Lily at the piano :) My current pets don’t like my piano so much, but in the past I’ve had cats that loved to bang on the keys! 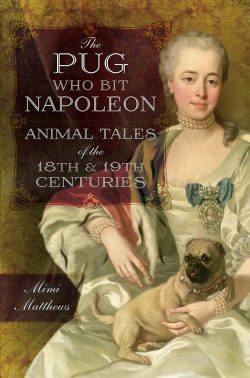 I agree, Vickie :) Pets of all types seem to act as a conduit for creativity – at least in my personal experience and from what I’ve read of historical writers & artists who kept their pets near as they wrote/painted/composed. My cats don’t seem to help me when I’m writing, other than to lay beside me at times, they do always assist when I am doing needlework! They inspire me to keep things put away lest they swallow a needle or something. I do not see how anyone can *not* love cats! I love that your cats assist with your needlework :) I hate to think what damage my own would cause!